1 Small Teal wrap (7″ x 8″) – good for cut cucumbers, avocados, small trail mix, fruit and to top jars. 1 Large Blue wrap (12″ x 14″) – good for sandwiches & left over pizza slices, celery, cheese, larger bowl or dish, larger melon, grapes, greens, beans and asparagus. nuts, snacks, cheese and cooked / smoked meats – virtually any perishable. 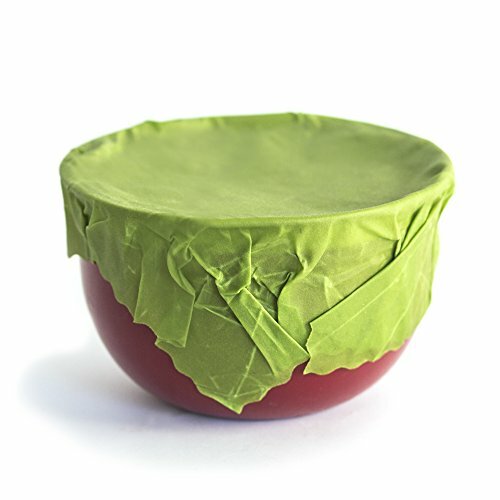 The wraps stick to themselves and provide a clean and protective seal. Washing Instructions: Wash in cold water with eco friendly dish soap and a soft sponge – hang to dry. Avoid: Microwaves, uncooked meat and more than a month of freezer use. Enjoy your Etee Wraps! They are reusable, biodegradable and plastic free. Food items shown in photos are NOT included.